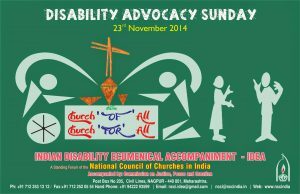 NCCI | DISABILITY ADVOCACY SUNDAY – 2014. DISABILITY ADVOCACY SUNDAY – 2014. Disability Day, or the International Day of People with Disability, is a day that is sanctioned by the United Nations. The aim of Disability Day is to encourage a better understanding of people affected by a disability, together with helping to make people more aware of the rights, dignity and welfare of disabled people. Disability Day was founded in 1992 and is a day that is marked around the world by a variety of events held in many countries. The original name for this day was the International Day of Disabled Persons. The day’s origins date back to 1981 and the International Year of Disabled Persons, which was created to improve the lives of disabled people all around the globe, as well as to prevent disabilities from occurring in the first place. The Day is used for holding discussions, forums and campaigns relating to disability, and communities are encouraged to organise performances in their local area. These can range from hosting a musical to a play, and disabled people should be involved in these productions. The overall aim is to show that a person with a disability can be a vibrant member of society. Each year the day is celebrated there is an emphasis on a new aspect related to improving the lives of people living with a disability. In 2012 there was a call to help disabled people live in an inclusive society in every country, and to make sure that society was as accessible as possible for disabled people. Leader: We come together today as people with different skills, different abilities, different disabilities. People: We come, however, as one body in Christ. Leader: We ask God to help us to be compassionate toward all, even as God has been compassionate toward us. People: Gather us together, in compassion and in faith. Help us to welcome and honor every on in this community. 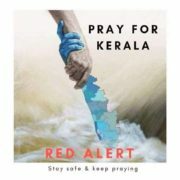 Leader: Open us, O God. Make us accessible to your Spirit, and accessible to all your people. AS prophet Isaiah announced the Lord’s Message: “For my house shall be called a house of prayer for all peoples (Is 56:7) here we are as people with many differences. Creator God, We rejoice at the community of believers gathered here regardless of their physical or mental capacities. God our life and way, may we who are made in your image, mirror your compassion, creativity and imagination as we work to reshape our understanding about you and the mission that you have entrusted upon us. Enable us to discern the unique talents that you have given to us and accept one another without any discrimination. In you we are no longer alone or disabled, though differently-abled, yet united in one body for which you are the head. Trusting in Your wisdom and grace, we pray gratefully in Jesus’ name. Amen. Leader: God has forgiven all those who have truly repented of their sins and has cleansed us from all our iniquities, and God admonishes us to sin no more.Amen. Leader: Recognizing our dependence on the Lord to care for all God’s people, we bring thes petitions before God: that our churches may be welcoming inclusive communities to all people, especially those who may be overlooked by the rest of society; that we and our brothers and sisters with challenging conditions may realize our dignity as sons and daughters of God through faith in Christ; that the people of God will openly receive the gifts brought by people who have disabilities; that we recognize the beauty of God’s creating hand in each person regardless of any human limitations we may have; that the God of Reconciliation will unite all of us in praise for making each of us the special person we are. Leader: there is lack of congruence in everyday family life between meeting the needs of the disabled child and those of other family members; there was a lack of integration of the disabled child into everyday family life and the wider community; and, parents held concerns about the effect of the disabled child on their siblings now and in the future hence many disabled children are deposited in orphanages and inns. All: Lord give us your grace to understand these disabilities as your design, wherefore we do not throw them out but enjoy their fellowship at home. We praise you for the gifts you give to each person. Help us accept ourselves and one another as brothers and sisters regardless of abilities and challenges. Help us love each other with Your love which excludes no person. We ask this in Jesus’ name, our Lord and Savior. Amen. We believe that, as God’s creation, we are fashioned uniquely, each endowed with individuality of body, mind, and spirit; To worship freely the One who has given us life. Each of us has abilities; each seeks fulfillment and wholeness. Each of us has disabilities; each knows isolation and incompleteness. Seeking shelter from the vulnerability we all share, claiming our promised place in God’s Household of Faith, We are transformed by invitation, affirmation, and love of God. Following the model of Jesus, We believe and affirm to treat all people as people as I wish to be treated, speak directly to the person living with disability not only to the nearby family member, companion, interpreter, or the canine companion, shake hands when introduced, offer assistance and wait until the offer is accepted, be patient and wait for person living with disability speaking, rather than speaking for the person. And we will treat adult with developmental disability as adults, not as children. 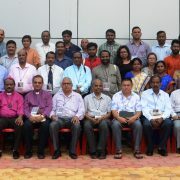 We believe that the church’s true and meaningful fellowship is to be found only in its openness to all people regardless of physical and mental condition, its acceptance in the ministry of the church as Bishops, priest, pastors, evangelist and in its governance and its availability with varied aids and facilities to cater person with Disabilities. Creator God we thank you for reminding us that we all are one in Christ irrespective of our abilities and disabilities. We are created in Your image in order that we would identify your image in our beloved friends who are differently abled. Enable us to see each other through Your eyes of love and compassion. We thank you for opening our eyes through this service, let this conversion in us be a stepping stone to unite everyone in You irrespective of their abilities and disabilities. Help us to see that our differences bring pleasure to You and make us channels of bringing dignity to the differently abled people in our Church and Society. In Christ name we ask. Amen. The Peace of God, which passes all understanding, keep your hearts and minds in the knowledge and love of God and of his Son, Jesus Christ our Lord: May we recognize the perfection of God in all who are created in the image of God and accept the abilities of the disabled and create a new order without any discrimination. A Resolution on Disabilities, Christian Reformed Church Synod, 1985. That All May Worship: An Interfaith Welcome to People with Disabilities,National Organization on Disabilities, 1997. At Worship with the Disabled, National Liturgy Office, CCCB, Canada, 2006. 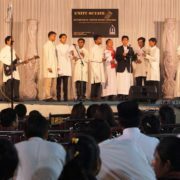 Disability Awareness and Music and Worship Resources, Believers in the Word Full Gospel Ministry, Georgia, 2010. 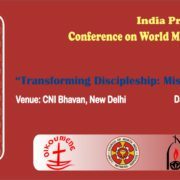 Members of Indian Disability Ecumenical Accompaniment (IDEA), Commission on Justice, Peace and Creation, NCCI, 2011.
http://ncci1914.com/wp-content/uploads/2016/08/Disability-Poster.jpg 1035 1600 Neelam Gaikwad http://ncci1914.com/wp-content/uploads/2018/05/NCCILOGO105-300x72.png Neelam Gaikwad2014-11-17 11:14:522016-08-26 11:17:46DISABILITY ADVOCACY SUNDAY - 2014.